I have been following this KAL for several months. I've recently taken the plunge into blogging, so I can finally share some of my own photos. I finished this sweater a couple of months ago. It was such a quick knit. Great for TV watching or magazine reading! I used 11 balls of KnitPicks Andean Silk in Olive. The yarn was soooo nice to work with, but I find it to be pretty scratchy when knit up. I have to wear a shirt underneath it. I added a couple of decrease sets like many of you, but otherwise knit the pattern as written. I can definitely see myself making another one of these sweaters. Maybe with the Cash Iroha! I really like that color -- I'm already thinking I need to make a KnitPicks version of this for myself, and I'm not even halfway done with my first hourglass! Beautiful! 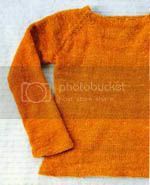 I made mine in Orange (KP Andean Silk). It gets softer after the wash. It's the most worn object this Fall. Thank you! That's good to know that the Andean Silk gets softer after washing. I haven't washed mine yet because I just wanted to wear it! Your sweater looks gorgeous. How did you block it?